Farouk meets us after breakfast. He’s going to be our guide for the next two days. 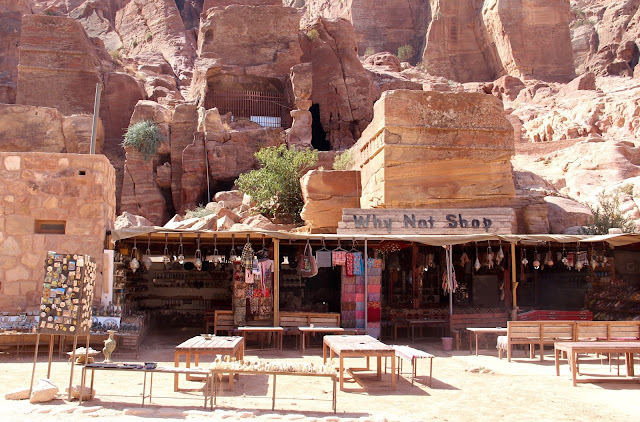 As we walk towards the Siq, the path through the gorge into Petra, he tells us about himself. “I’m one of sixteen children,” he says. 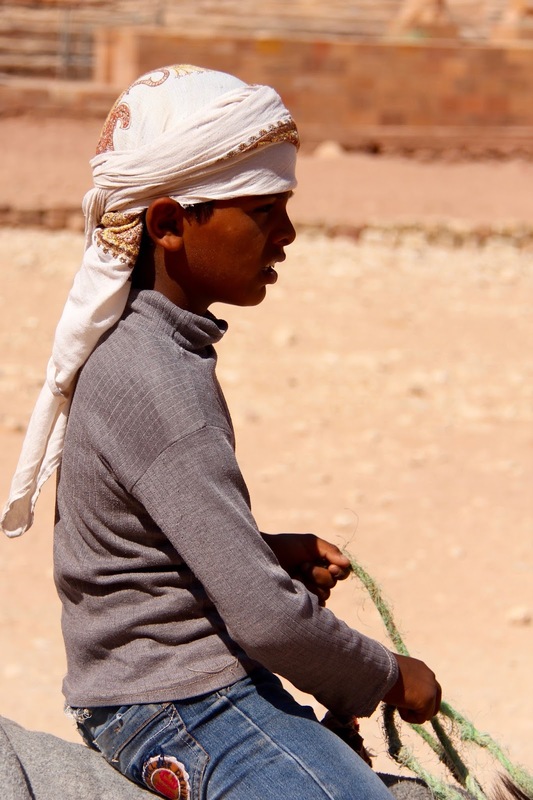 “My father is a Bedouin, he still lives in the desert.” We listen as he carries on. One thing we learn very quickly about Farouk is that he does a good monologue. 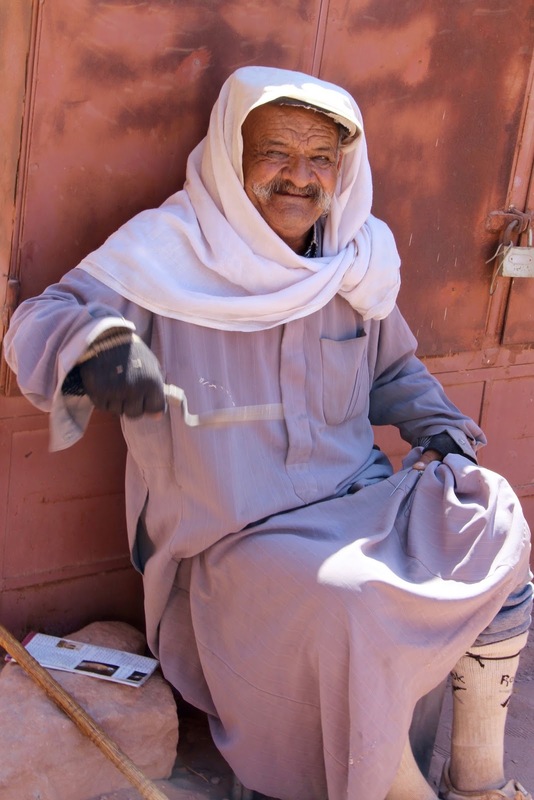 “I was the only one in my family to leave the desert and move into the city. 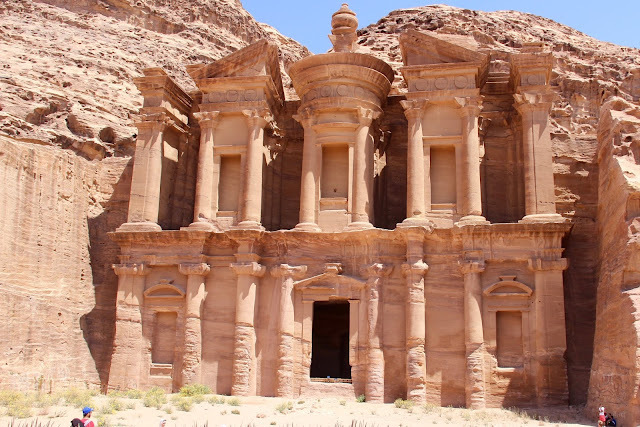 I went to Jordan University.” Some time later, after stories of childhood hospital visits, a random meeting with King Hussein, and the eucalyptus trees he’s planted in his garden so everyone can see where his house is, we reach the end of the Siq. 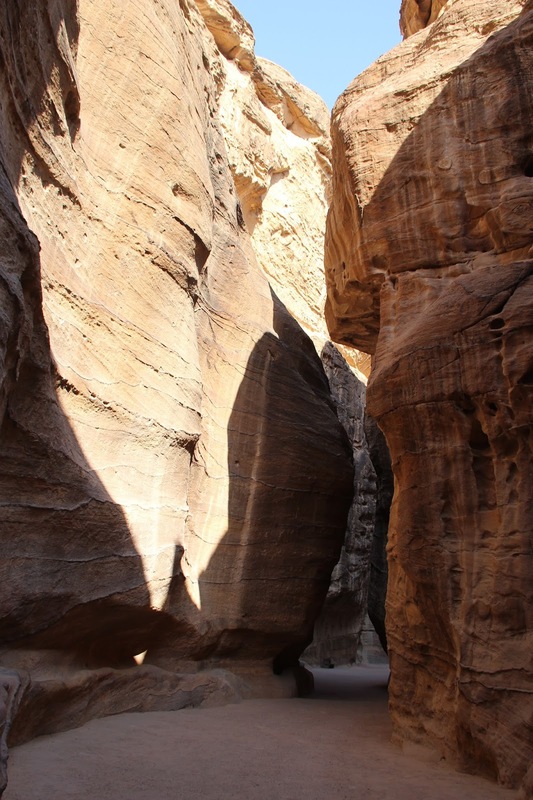 Along the way we’ve seen ancient Nabatean water channels; those on the left for irrigation, and the ceramic pipes on the right for drinking water. We pass a larger than life relief of a camel caravan, designed to let traders know they were going in the right direction. We’ve also seen votive niches carved into the walls, small shrines for Nabatean gods. 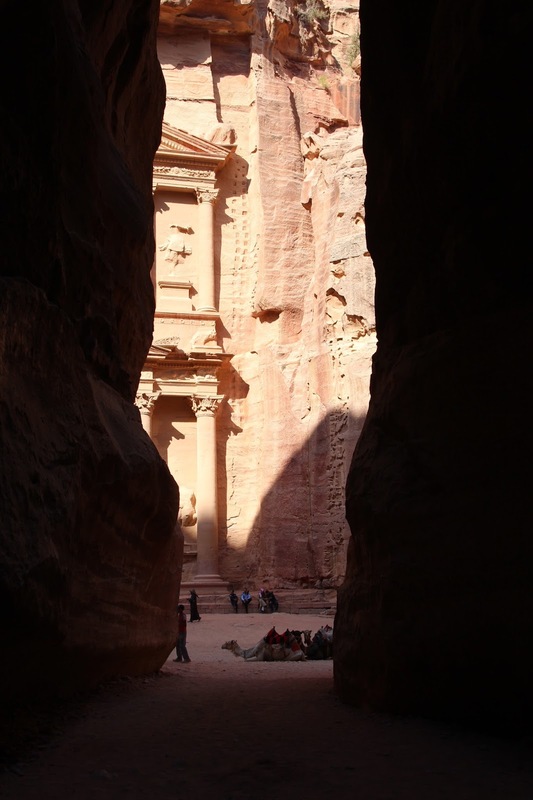 Then as we turn the corner, a narrow shard of light catches The Treasury or al-Khazneh. The impact of this on early travellers must have been extreme. The façade’s monumental proportions and mix of styles would have sent an immediate message that Petra was no small desert outpost but a thriving international metropolis. The façade combines Greco Roman columns, Assyrian crow steps, and a representation of the Egyptian god Isis, just below the Greek goddess Tyche at the building’s apex. 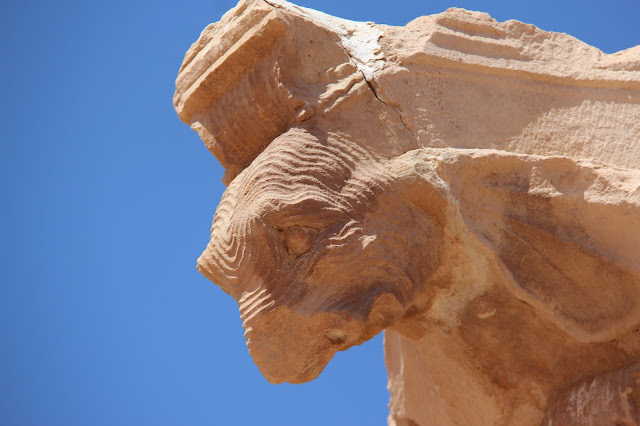 It also contains unique Nabatean features, the broken pediment and the link between the central goddess Tyche and the Nabatean deity, Al-‘Uzzah. Most of the decorative elements are funerary, for instance Castor and Pollux either side of the portal, guiding the souls of the dead to the Elysian fields. 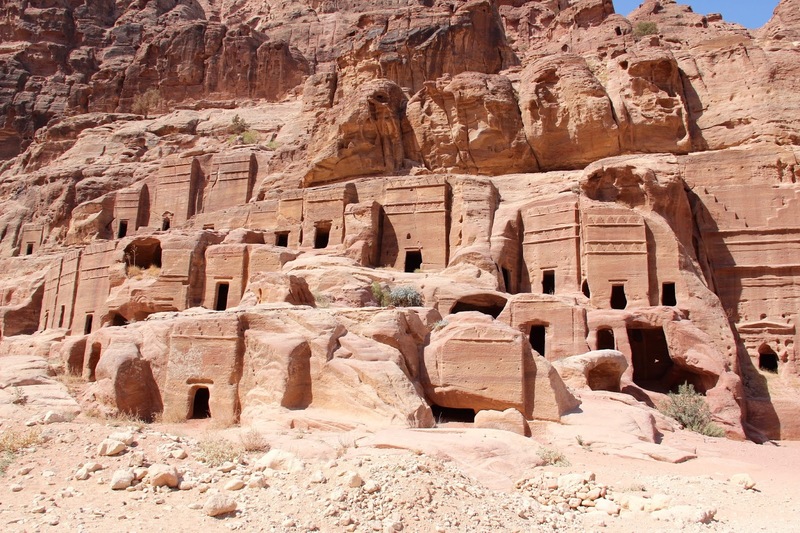 So despite the popular myth that al-Khazneh contained hidden treasure, and despite the highly visible pot shots at the façade’s uppermost urn in search of it, it’s far more likely that al-Khazneh was part of the Nabatean funerary cult and just one of the many tombs carved into Petra’s sandstone hills. The secret of the Nabateans' increasing wealth and power was two fold. Firstly, their ability to source and store water in an arid desert environment. Secondly, their monopoly of desert routes from south-western Arabia, as far as Madain Saleh, up to the Mediterranean port of Gaza. 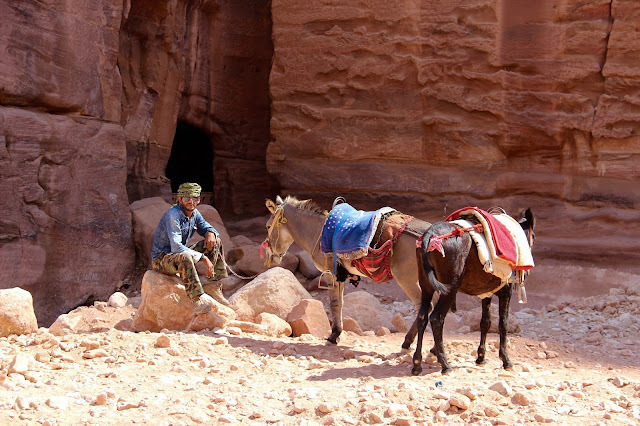 From about 100 BC they controlled trade in frankincense, myrrh and spices, sometimes as traders but mostly as middle-men, extracting taxes from camel caravans who stopped at their garrisoned outposts for water and rest. 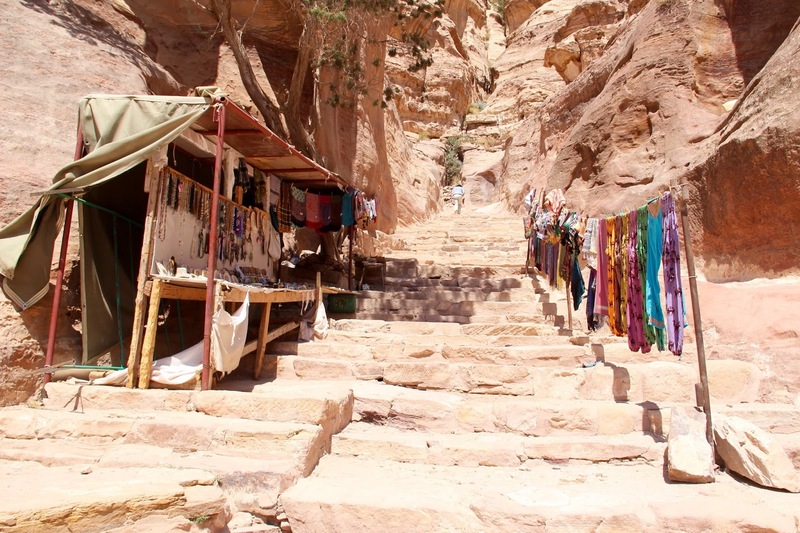 Later we walk down the Roman colonnaded road and climb the steps to the Great Temple. Here we see Indian elephant heads decorating the capitals of columns, another unexpected and distinctively Nabatean feature. We pass the 5,000 seat theatre. I’ve read that it conforms precisely to rules specified by Vitruvius for shape, proportion, orientation and stage design for perfect acoustics. I’d like to go in and see for myself if this is true, but it's cordoned off and so we carry on. 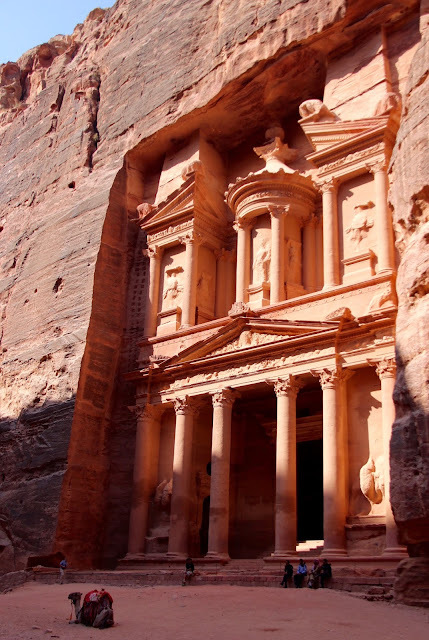 Despite the Greco-Roman design, it too is uniquely Nabataean. 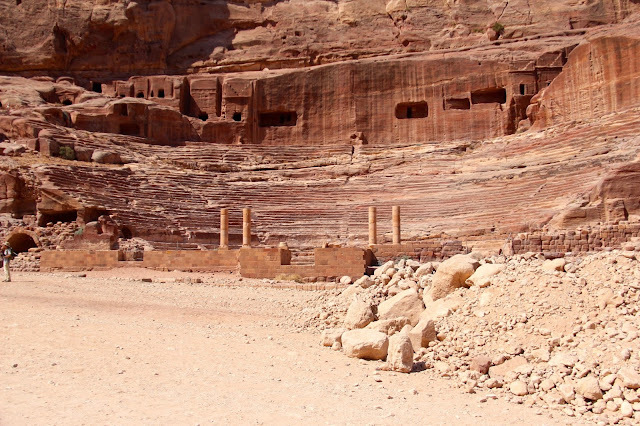 Ancient theatres were traditionally freestanding, but this one is carved into the sandstone hills. A little later, we leave our guide behind. 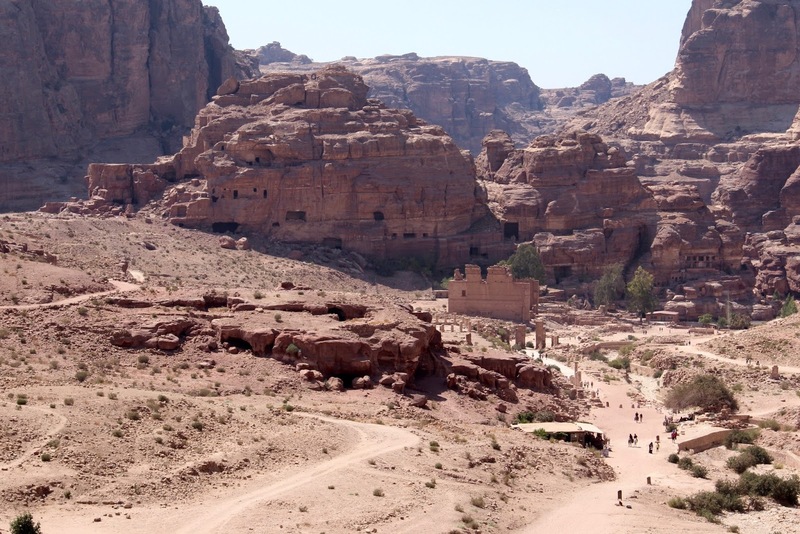 We want to climb the 900 steps to The Monastery, ad-Deir and he’s not keen unless we give him more money. In any case, we’ve grown a little tired of the monologue so the prospect of our own company is appealing. It's a long hot climb, but worth it when we reach the top. We sit opposite ad-Deir in a small café and drink Arabic coffee. The view and the small breeze rustling the bougainvillea beside us are both perfect. On the way down we pass a sign saying Lion Triclinium and I’m curious. Triclinium means literally three couches and it’s believed that memorial feasts were held in these places to honour the dead. We stop and almost instantly a small bright-eyed face appears beside me on the path. She points at the arrow and motions me to follow. I step off the track and walk a short distance. More climbing and then in the distance I see it up on the hill. I take a photo and then another of my little guide. “See,” she says, tapping the viewfinder of my camera with an impatient finger, “Lions.” There are two of them, one either side of the portal. 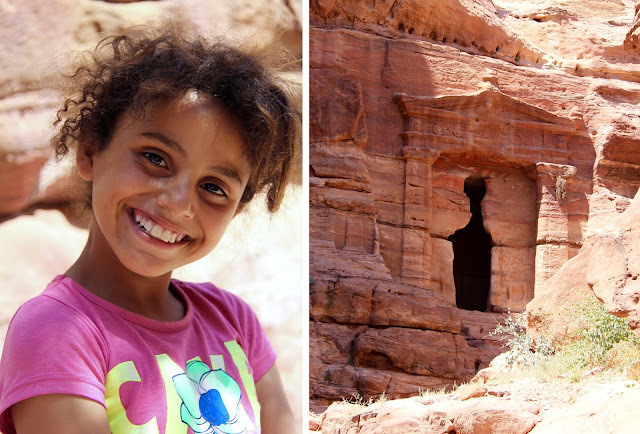 As we walk back she tells me her name is Yasmine, she’s nine and learning English at school. I tell her how well she speaks, thank her, and then carry on down. We continue our walk back to the Siq repeatedly saying no to all those offering us rides. 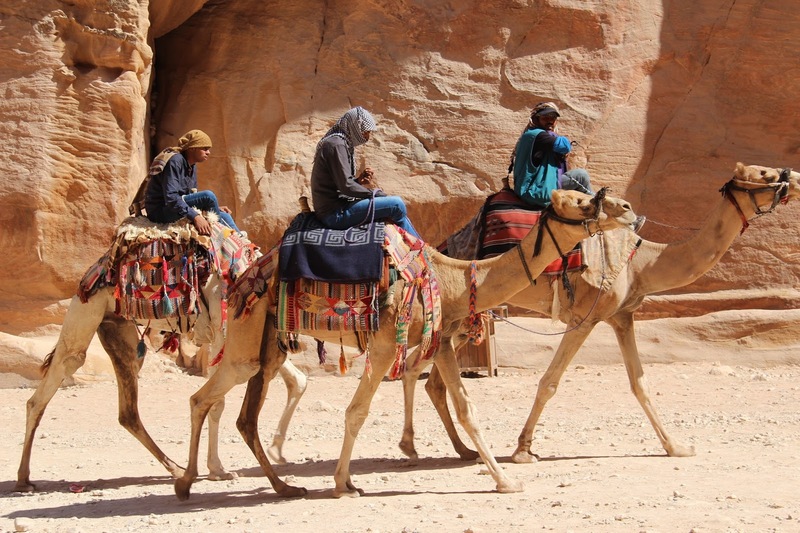 There’s a choice of donkeys, camels, horses or covered wagons, but we are happier walking. It's so much easier to take in everything we pass, even the small, rapidly emptying shops. We climb to the Royal Tombs with their distinctive broken pediments, central Greek tholos and crow steps, signifying a staircase to heaven. The insides are cool and dark, the only carving, burial cavities around the walls. On the way down, we pass souvenir sellers and I stop by one who holds up a trowel and motions in the air telling me that he dug all these up himself. I look at his small oil lamps and spot one decorated with a rectangular, almond-eyed face. 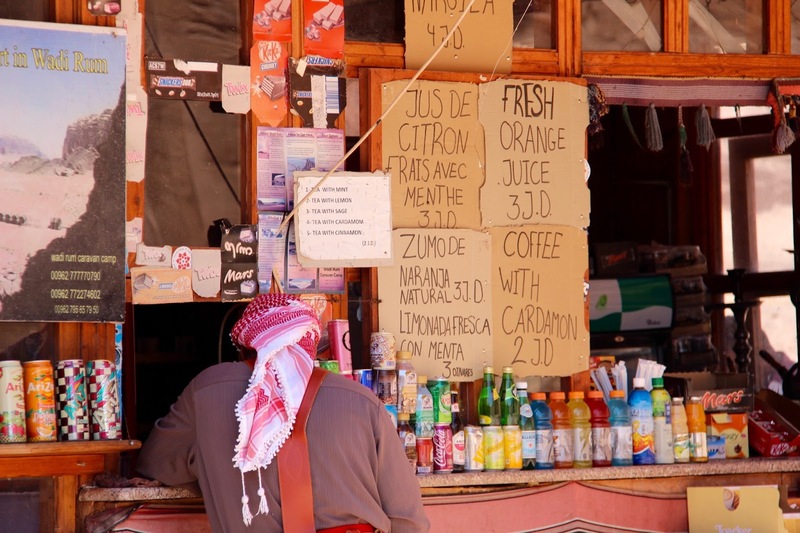 It’s distinctively Nabatean and I’m drawn to it, but it’s too hot to stop and I am too tired to bargain. We pass a signpost to a Byzantine chapel, built in the 5th century after Petra had been abandoned. It makes me think. 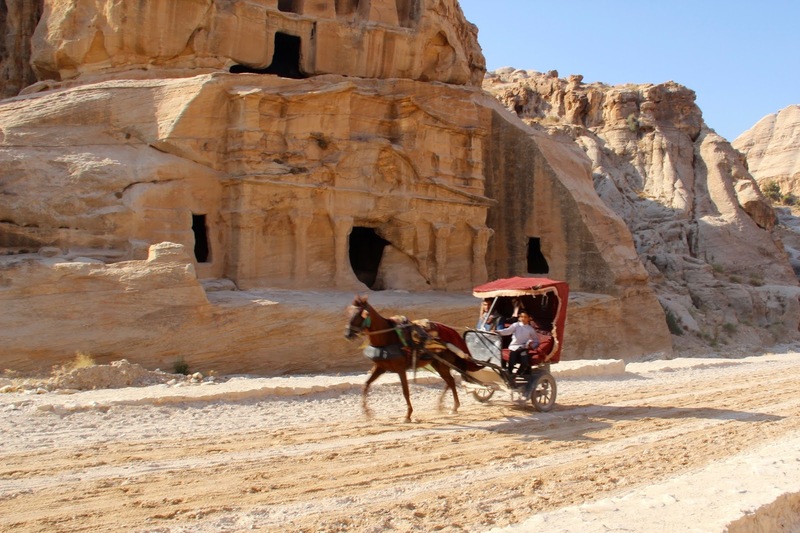 The Nabateans began as nomadic Bedouin. By 100 BC they had built Petra, become city dwellers and accumulated vast wealth. 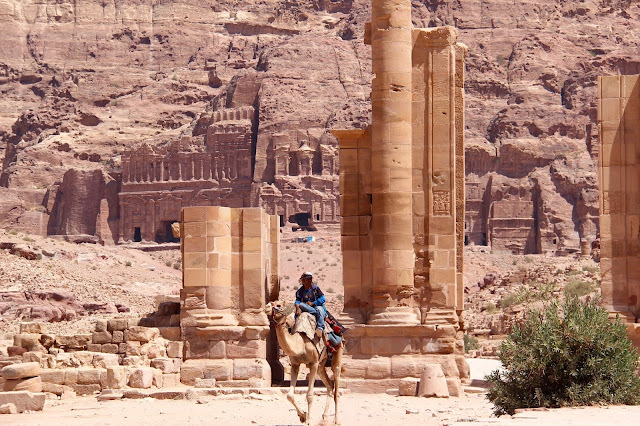 By 100 AD, when the Romans began shipping incense up the Red Sea to ports closer to Egypt and the Mediterranean, they lost their monopoly as traders, and so began the inevitable decline back to desert obscurity. I remember a particular series of lessons I loved teaching when I was in New Zealand. I called it “Lost, Forgotten and Buried”. It was about ancient civilisations that had disappeared over time: Tenochtitlan, Pompeii, Fatehpur Sikri, Machu Picchu, Angkor Watt. 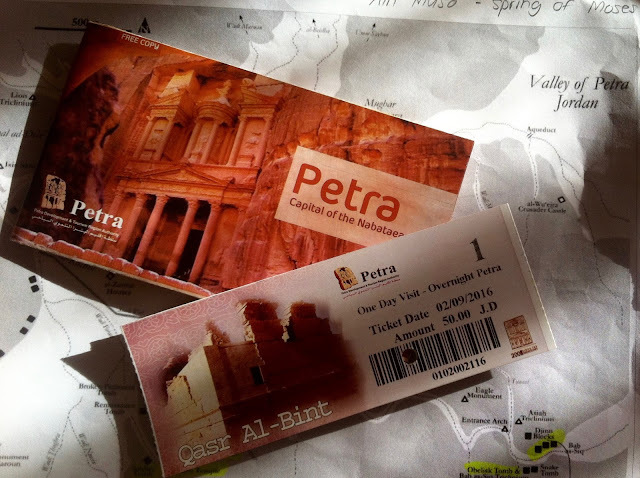 Had I known then what I know now, I would have added one more to the list: Petra.